There’s an old adage that a 90-foot oak tree with a 90-foot spread will lose more than 90 gallons of water daily when the temperatures are about 90 degrees. Ninety. Gallons. Nine, zero. I know I’m guilty of watering trees and shrubs the same way I do perennials: give their roots a 15-30 second dousing with the hose every morning and hope that this does the trick. But for established trees, this method is only wetting the top of the soil, meaning the water that actually gets to the roots is a lot less than what you applied, and certainly a lot less than the ~90 gallons that it needs during hot, dry spells. Trees get most of their moisture from deep in the soil, down where the water table lies. Because they tap into these deep stores of water, they are generally unaffected by short dry spells, and we are often unaware of how much they are really “drinking”. But when real drought lowers the water table out of trees’ reach, they need a lot of supplemental water from us to stay healthy. rhead watering wand first loses water to the wind, depending on the weather. Next, a lot of the water evaporates before it can really soak into the soil. Depending on how hot and dry the weather is, this evaporation loss can be as much as 50%. On slopes you also have to contend with runoff, which regularly will waste up to 25% of the water you apply. Then any turf grass or weeds gets to “drink” first, further reducing the amount of water that gets to your trees’ roots by up to 25%. With so much water going to waste, it takes numerous gallons and a long time to adequately water a tree. wonderfully, holding over 6 gallons while they slowly soak down into the root ball. This kind of invention is an absolute life-saver for dry, windy, or sloped spots where your mulch blows away and your water runs off or evaporates before it can soak in. 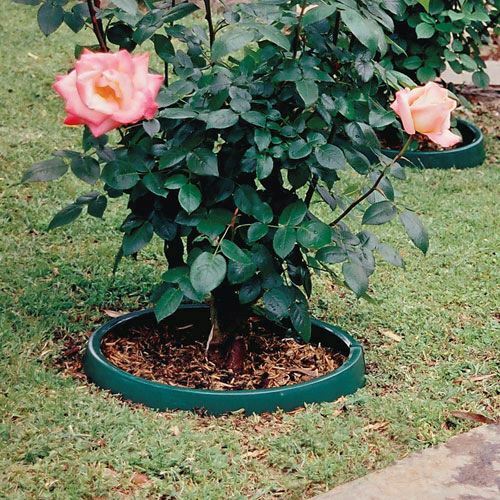 The attractive ring also gives a tidy appearance to the base of your tree and protects your plant from weed-eater strings. Despite its simplicity, this device is a crucial water-saving technology that could go a long way towards preserving trees while alleviating drought in areas like Australia or California. It is capable of eliminating water loss due to wind and delivering water directly to a tree or shrub’s root ball. It can hold in mulch and keep it from blowing away, which will in turn increase the mulch’s ability to choke out weeds and to reduce water loss to evaporation. The result is that you can keep your trees healthier using less water and less time. In a case study, the Greenwell™ allowed the city of Brimbank, Australia to use 25% less water on tree irrigation that year while keeping their trees happy and healthy. From townships to orchards to wooded lots to rose gardens, this ring is fantastic for delivering water right where plants needed without wasting a single drop! Jackson and Perkins is proud to be one of the first and only US retailers for this revolutionary, eco-friendly product! This product is sure to become a garden staple, and once it catches on, it might be on back-order for some time. So order yours today and start doing your part this season to conserve water (and time)!